It’s that time of year again, when the mornings are starting to get a little chilly and the kids are off to school again. To help make sure they arrive safely both to and from school, take a look at these four back-to-school safety tips to go over with your kids. All school-aged children should have at least one important phone number memorized, as well their home address. If you don’t have a home phone, make sure your kids know your cell phone number and where they live. Ideally, they’ll also know the number of another trusted adult in case they can’t get ahold of you. 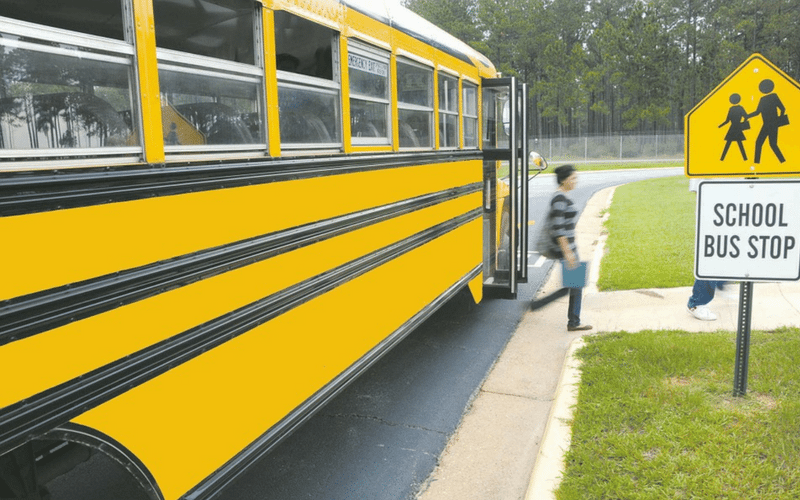 If your child walks to the bus stop, plan out a route from your house ahead of time and walk it once or twice with them before the start of school. That way, they’ll know the easiest and safest way to get there and back. Reinforce the warning that your kid should never talk to or go away with a stranger, no matter what he or she says. Some families find that using a secret code word is a safe way to arrange for someone else to pick him or her up in the event of an emergency. Teach your child that they should only get in the car with adults who know this secret word. Otherwise, they should find another adult like a teacher, bus driver, or coach for help. This can also be a good time to talk to your kids about bullying and what they should do if they or another student are being bullied. Whether your kids are walking, biking, or driving to school, going over traffic signals with them is a good way to remind them to stay safe on the road. Teach your kids to walk in the direction against traffic, and bikers still need to abide by the rules of the road.